The smoke that comes out of an “incense stick” is warm and it is being continually heated. It is a collection of solid tiny particles and air that is entrained into the mass. Close to the incense, the smoke's flow is very smooth, or laminar. The shear layer of smoke flow rolls up naturally to produce counter-rotating vortices in the smoke plume which are the result of the Kelvin-Helmholtz instability. As the smoke rises higher and higher, it speeds up due to the lower density of warm air compared to the surrounding air (natural convection). Since it is speeding up as it rises, it will eventually reach a speed at which its flow becomes chaotic, or turbulent. The speed up varies from the middle of the plume out to the sluggish edges as can be seen in the front view (left) and side view (right) of the smoke in the pictures. 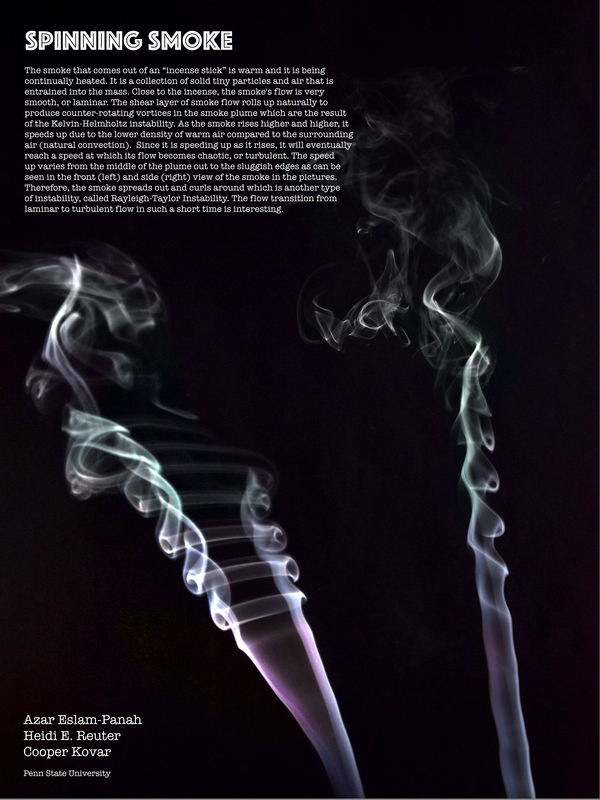 Therefore, the smoke spreads out and curls around which is another type of instability, called Rayleigh-Taylor Instability. The flow transition from laminar to turbulent flow in such a short time is interesting.